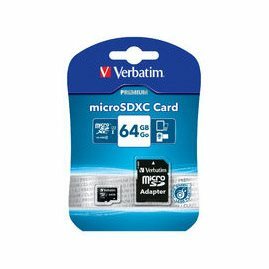 Verbatim SDXC 64GB The microSDXC (SD eXtended Capacity) memory card is designed to handle large volumes of data at high speeds. microSDXC is high capacity portable storage ideal for use in a tablet or camcorder with microSDXC expansion slot. microSDXC cards are able to handle significantly greater amounts of information due to two advances in technology. The exFAT file system enables the microSDXC card to handle large volumes of data while the UHS-1 interface can transfer videos and picture files with speeds of up to 104MB/sec.